I could be wrong, but I can remember only once in my childhood, saying, “Mu-um, I’m bored.” My mother’s solution, while I can’t remember it exactly, had something to do with tasks that did not appeal. At all. Like cleaning my room. So I found something fun to do on my own. Problem solved. And more importantly, lesson learned. Writing a post last week about boredom with my summer wardrobe started me thinking about those long, hot summers as a kid. And how we mostly relied on our own initiative to amuse ourselves. And how the possibilities of what we might do to amuse ourselves were constrained mostly by our own imaginations. And only occasionally by the fact that some things “weren’t allowed.” Which …actually… to be honest… didn’t always stop us. Sorry Mum. And that started me thinking about the stuff we got up to. Building “camps” in the woods, riding our bikes, acting out stories that involved whatever favourite television show we were watching that year. Bonanza was big for a while. I distinctly remember trotting around the yard making clicking sounds with my tongue to imitate horses hooves, and pulling up on invisible reins, to toss imaginary lassos around cattle… or bad guys. Riding and wrangling was supplanted only by our craze for being spies like in Get Smart. I always wanted to play Agent 99. I recall using a hand mirror from my homemade “spy kit” to see around the corners of buildings, checking for enemy agents. Then there was always reading. Or drawing. And planning parades. This was my brilliant idea. That’s because my older sister had a twirling baton, and if we had a parade I’d be majorette. I remember we assembled all of our doll carriages, dolls dressed to the nines, ourselves in whatever fancy hats and gloves we could scrounge and we marched up and down the road in a line with me and my baton leading. Gad. I must have been bossy back then. You see, it was usually me who organized the six or seven kids around my age in our small neighbourhood. When I was a bit older, I made lists of possible activities. 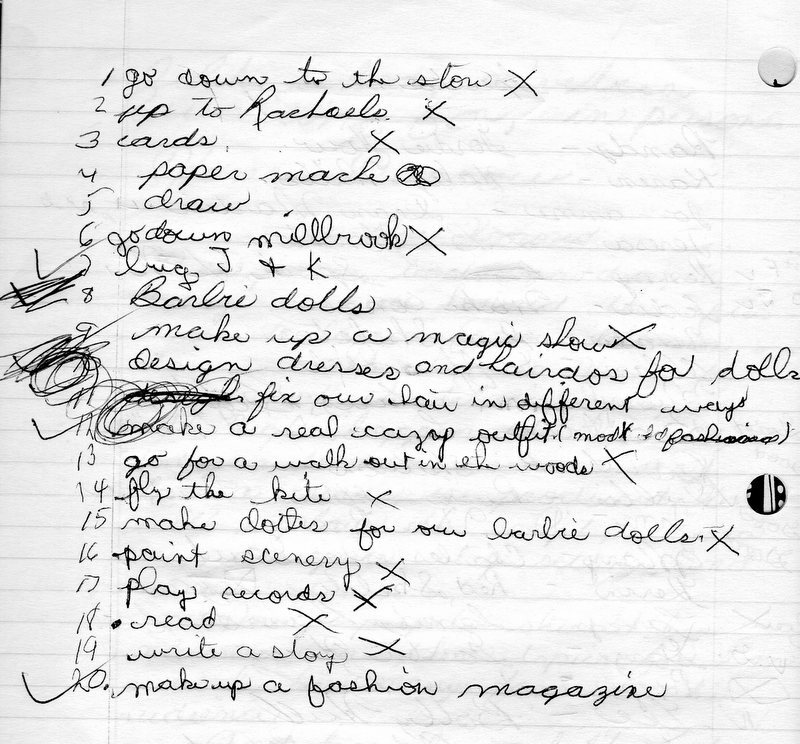 I loved list-making even back then. This morning I dug around in a pile of old sketch pads and school notebooks that I carted home when my mum closed up the farmhouse, and I found this list of potential summer activities from 1968, written on the back of a page in my grade six English notebook. Please note that # 6 was “not allowed.” That was because Mill Brook had a cement dam across it with a deep mill pond built for the old sawmill that had long since been torn down. But for us there were tadpoles to be caught in the pools below the dam, and thrills to be had when we dared to walk across the narrow top where the water gushed through the old sluiceways. Looks like #20 was a winner, though. Now, why doesn’t that surprise me? Seems I was obsessed with fashion even back then… whether for myself or for my Barbies. It wasn’t that we were left on our own all summer. I remember going swimming with my older sisters sometimes. Or after supper baseball games when the adults would come out and play with us. My mum could run bases like anything. And when I was around eight I remember hosting a pyjama party, or my idea of a pyjama party. I invited all the neighbourhood kids to come to my house after supper in their pyjamas. Mum made us popcorn and my sister Connie lit a candle and told us ghost stories. Then everyone went home, no doubt dashing through the summer dusk shrieking, pursued by “bloody boots” or some other spectre conjured up by my sister. Our summers weren’t totally unsupervised. There were always adults around somewhere. It’s just that they didn’t always figure into our plans, or decide for us what we did. And if we were bored, well, we always came up with something to do. Or made a list. And it turns out that we probably learned pretty useful skills running a bit wild, left to our devices during those long summer days. Being bored. And then finding a way to amuse ourselves. In an article in Quartz magazine, Olivia Goldhill quotes psychologists and child development experts who believe that children need to experience boredom. London based child psychologist Lyn Fry says that children who learn how to be bored also “learn to motivate themselves to get things done. Being bored is a way to make children self-reliant.” Fry says parents shouldn’t try to fill up “all their child’s spare time” with structured activities because then kids “never learn to do this for themselves.” You can read Goldhill’s article for yourself here. And according to Jessica Lahey’s article Why Free Play Is the Best Summer School in The Atlantic, psychologists believe that “free play,” or unstructured activity, helps children to learn to “make their own decisions, solve their own problems,” and develop something called “self directed executive function.” The article defines this as the “ability to generate personal goals, and determine how to achieve them on a practical level.” So, kids who participate in more unstructured activities gain a greater ability to “self-regulate,” and develop more independence than kids who participate in structured, adult-run activities. I do recognize that times have changed, and in most neighborhoods, letting kids have as much freedom as we had back in the sixties is probably not realistic. Or safe. Still there is something to be learned here, isn’t there? That maybe all those planned, scheduled, structured, organized, educational summer camps and activities might just be a teensy bit too much of a good thing? Anyhoo, I’m glad that Mum didn’t solve my boredom problem for me way back when. That was a good lesson for me to learn. And probably the genesis of my list-making ability. When I was researching this post I couldn’t get this scene from the new Sherlock out of my head. The one where Benedict Cumberbatch as Sherlock is soooo bored! Now there’s a boy who needs to learn how to deal with boredom. Appropriately. Or he should get sent to bed without any supper. Have a look. He’s the perfect Sherlock, isn’t he? Every bit as good as Jeremy Brett in my opinion. But I digress. What’s your take on summer boredom, folks? What do you recall of those long summer days when you were a kid? Or when your kids were kids? Any thoughts? I love this post. You had me thinking back to what I used to do during summers. I think children often have too much of their time structured and depend on adults to direct them. I grew up in a farming community, where summers meant lots of work done by the adults, so children had to come up with their own activities. I was rather shocked in highschool when I met people who went away to camp for the summer. Camp?? How come I never went to camp? I was envious. By the time I was a young teenager, we had moved to the farm. And all the kids were busy helping one or another farmer bring in the hay. Lots of Mums including mine were feeding "stray" kids from the neighbourhood at lunch… kids who didn't live on farms themselves but just showed up to help hay. My stepdad was a big favourite for this. He was always so patient and affable he had a constant "crew" of kids helping him. Rather a different summer experience from my friends from town… who, like you said, all went to camp in the summer. Great post! Brings back lots of fun memories. Thanks Elaine. It brought so many for me as well. Love this post too. Gosh, I can relate to almost everything on your list, except Bonanza LOL. We used to hike the streams that ran through the nearby parks and golf courses and pretend we were explorers. We also used to climb Scarborough Bluffs (which would be impossible now) and ride our bikes on day long treks. I also loved to sit under the big maple tree and read Nancy Drew books. Those were the days…..
Oh this brings back memories of wandering across the fields and riding my bike around the country lanes. No parental supervision. I do so agree about children needing to be bored so that they can make their own structure. As to what we were allowed to do or not do. Last night watched a programme about Keith Richards' childhood where he played on bomb sites and there was film of the scouts boxing! Yes boxing! I don't think either of these things would be allowed today. I guess that post WWII in England there would have been all kinds of bomb sites. Definitely wouldn't be allowed today. That was a lovely read & I can just picture you earnestly compiling your list . 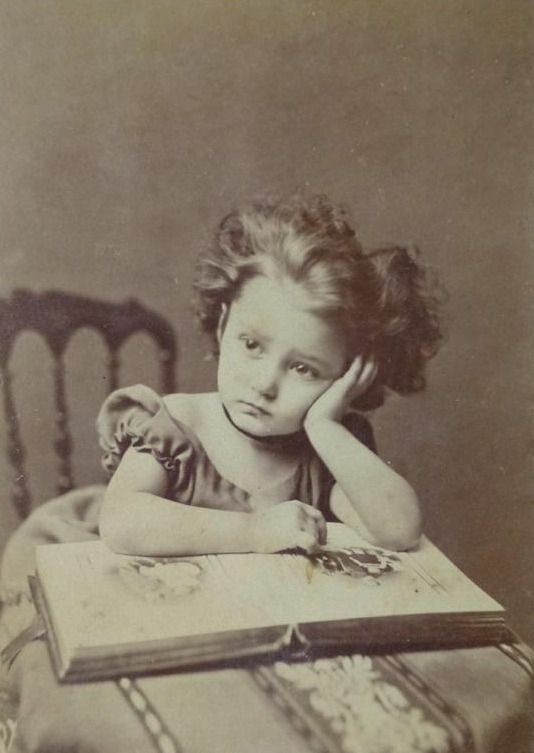 Yes , we knew better than to complain of boredom , mum's reply was always ' well I can find you plenty to do ' We were turfed out after breakfast to play in the fields by the local river , told not to come back till teatime & handed a bottle of ' pop ' ( soft drink ) & a sandwich each . Sometimes they were sugar sandwiches , sugar , can you imagine ! No wonder I have a sweet tooth now . But times were hard in late 1950s Britain & sugar was a real treat . Thanks for bringing back memories . Thanks, Wendy. Sugar sandwiches… I've heard of them, but never indulged. Our drink in the summer was stuff you mixed up from a packet… by adding water from the tap… called Kool-Ade. Pennies to make a pitcher full… and since my mum was a single parent with four kids at the time… price was the clincher. I remember the long free-range summer days. I do think I was bored on occasion, but learned how to find things to do. I think it is an invaluable skill, one that must be learned for oneself. When I look at the hours I spent wandering freely on my bike, or playing and camping, and the freedom that my grandson, and most children today aren't allowed, I am torn between thinking that yes, it is a different world, but that so much is also missed. We were young explorers. "clicking sounds with my tongue to imitate horses hooves" as we rode our stick horses. Yes, an actual stick, the nicest ones we could find in the bush. This post brought the memories rushing back. By the end of summer, we were thrilled to go back to school. You're right..we were so happy to back to school. Especially as we hadn't seen any of our "school friends" all summer. You post brought back some very fond memories of summers past. My current novel-in-progress includes many youthful summers for the MC so I have been doing a lot of delving into my memories of those long lazy bygone days. Thanks, Sandi. Oh, I remember making … puppet shows. For an audience of two. Puppets were big when we were kids. I remember making puppets out of small lunch bags. And getting a book with paper dolls to cut out and their outfits. We also made pretend walky-talkies out of lego and were "spies". We would climb fences and sneak into people's backyards in the evening pretending we were spies on a mission. I was a bit of a tomboy and jumped off our shed roof. We also played in the rafters up high in my friend's garage balancing on the beams and making pretend rooms up there on sheets of plywood. Me and my friends also "broke into" the club house "for boys only no girls allowed" next door and almost got caught, we were so scared. We also had tree forts and did sprint races down the street. There was also some kind of game with string, where we had to get in and out of string games..does anyone remember this? Its hard to describe. Two girls would be on either side with different levels of string, about 5 feet apart and would manouever them. I had some French friends, perhaps this was a French game. Oh, I remember paper dolls too. My mum used to subscribe to McCall's magazine…which I loved only for the Besty McCall paper doll in each issue..and her themed outfits. I've never heard of your string game. Maybe someone reading this can remember it, too. I could have written your first paragraph Sue ..word for word and yes, in my case it was definitely room tidying! I really enjoyed reading about your childhood summers that resulted in my reflecting on many happy memories of mine. Miles away from you in distance but close in experiences! Being the only girl I always felt my much older brothers had more fun! I always wanted to be like George in the Famous Five series! We spent days building rope swings over streams ..planning adventures ..secret clubs! :) Bike riding for miles ..always with a picnic! I don't remember sugar sandwiches like Wendy but I do recall a chocolate one once!! Funny how those summers were always long and sunny! Maybe mothers in the sixties were all like that? Didn't hurt us to be responsible for our own amusement, though. We used to take picnics on our bike rides too. Packed in our school lunch boxes. Had to keep our strength up for the "adventures." Sweet memories. My sister and I were children of the fifties. We were Annie Oakley and Dale Evans. I remember playing "kick the can"when it was almost dark with the sound of chirping crickets. Thanks for sharing. Ah, lovely post. Brought back lots of happy memories. Friends and I used to play Gilligan's Island and take "hikes" in the woods and be gone for hours. I don't think my Mom gave it a second thought. Funny, I've just discovered Sherlock on Netflix and have been binge watching. He makes my heart go pitter patter just a bit! Thanks, Laurie. Glad you enjoyed it. The new Sherlock is brilliant in my opinion. The modern twists added to the original stories, like Watson writing their adventures in a blog, are so creative. Susan, I enjoyed reading this post! I remember summers being never-ending fun. Playing in the side streets until the lights go out. Seven kids in my family and eight kids across the street. I find it sad that the kids these days don't know what that type of fun is like. I move to NC from NY keep looking for kids playing outside. Maybe I'm looking in the wrong places or maybe kids just don't want to do that kind of stuff anymore. Thanks for helping me relive some summer memories. You're welcome, Brenda. Thanks for reading. I don't remember being bored, as I had lots to do during summer. Although we did not live on a farm, we did live in a big house on a 1/2-acre lot, and we always had chores to do. For example, we had assigned daily household and yard work; we fed our chickens, rabbits and ducks and mucked out their pens, shelters and pond; we walked our dog; and we picked berries at local farms. During our open time, my siblings, neighborhood friends and I explored the adjacent woods and creek and built forts and eventually a tree house; roamed between our houses and backyards, and vacant lots, with our dogs; went swimming anywhere at any opportunity; played backyard baseball games; played in a nearby park; and once gathered spare lumber and other materials and tools to build a simple house, then tried to build it. I also did a lot reading, practiced the piano each day, and sometimes went to a day camp at the local park or to a 1-week Scout camp. In August, there was the annual 2-3 week family vacation, during which for many years we went camping at one of Oregon's lakes or went on a car trip to visit grandparents in Seattle and/or in Alberta. (When I was 7, my little brother and I got to fly by ourselves to, and spend a whole month with, our Alberta grandparents on their farm and in their little house in a town 100 miles east of Edmonton!) We spent the last several of my childhood family vacations at Wallowa Lake in N.E. Oregon, staying in one of 9 lakeside cabins at a rustic "fishing resort," exploring the area and playing in and on the waters of that lovely mountain lake. My husband and I tried to give our children summers with similar responsibilities and freedom to explore during the rest of the time. Although that was challenging because each of us had a career outside of the home, it was not impossible. Sounds lovely, Leslie. It seems that so many of us had similar experiences, no matter which country we grew up in.